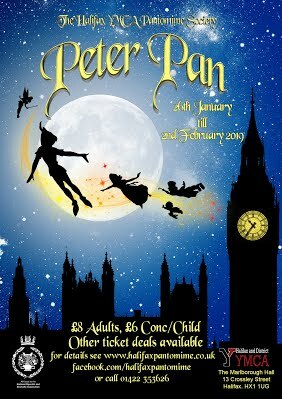 The Halifax YMCA Pantomime Society presents its production of Peter Pan from Wednesday 26 January to Sunday 30 January at YMCA, The Marlborough Hall, 13 Crossley Street, Halifax HX1 1UG. Tickets also available in person at the venue. This entry was posted in Events, Feb, Jan, Young People and tagged YMCA.